REYKJAVÍK, Iceland, May 31 2013 (IPS) - Soil is becoming endangered.This reality needs to be part of our collective awareness in order to feed nine billion people by 2050, say experts meeting here in Reykjavík. And a big part of reversing soil decline is carbon, the same element that is overheating the planet. “Keeping and putting carbon in its rightful place” needs to be the mantra for humanity if we want to continue to eat, drink and combat global warming, concluded 200 researchers from more than 30 countries. “There is no life without soil,” said Anne Glover, chief scientific advisor to the European Commission. “It takes half a millennia to build two centimetres of living soil and only seconds to destroy it,” Glover said. The world will likely need “60 percent more food calories in 2050 than in 2006”, according to a new paper released May 30 by the World Resources Institute. Reaching this goal while maintaining economic growth and environmental sustainability is one of the most important global challenges of our time, it concludes. Urban development is a growing factor in loss of arable lands. One million city dwellers occupy 40,000 hectares of land on average, said Rattan Lal of Ohio State University. Plowing, removal of crop residues after harvest, and overgrazing all leave soil naked and vulnerable to wind and rain, resulting in gradual, often unnoticed erosion of soil. This is like tire wear on your car – unless given the attention and respect it deserves, catastrophe is only a matter of time. Erosion also puts carbon into the air where it contributes to climate change. 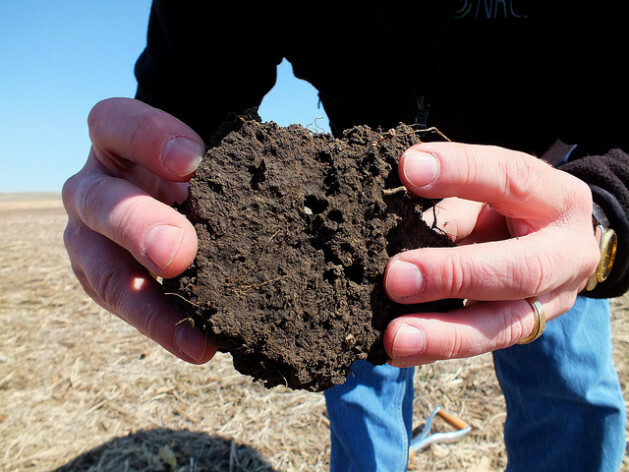 But with good agricultural practices like using seed drills instead of plows, planting cover crops and leaving crop residues, soils can go from a carbon source to a carbon solution, he said. “Soil can be a safe place where huge amounts of carbon from the atmosphere could be sequestered,” Lal told IPS. When a plant grows it takes CO2 out the atmosphere and releases oxygen. The more of a crop – maize, soy or vegetable – that remains after harvest, the more carbon is returned to the soil. This carbon is mainly found in humus – the rich organic material from decay of plant material. Soil needs to contain just 1.5 percent carbon to be healthy and resilient – more capable of withstanding drought and other harsh conditions. “Healthy soils equals healthy crops, healthy livestock and healthy people,” Lal said. Farmers and pastoralists (ranchers) could do “miracles” in keeping carbon in the soil and helping to pull carbon out of the atmosphere and feed the world if they were properly supported, Lal said. The world’s 3.4 billion ha of rangeland and pastures has the potential to sequester or absorb up to 10 percent of the annual carbon emissions from burning fossil fuels and cement production, estimates Ólafur Arnalds, a soil scientist at the Agricultural University of Iceland. Eliminating overgrazing and using other pasture management techniques will reduce the number of animals on the land in the short term but it is better for the long term health of grazing lands. While these practises can help with climate change, there many other good reasons to adopt them, Arnalds told IPS. That view is echoed by many here since determining exactly how much carbon a farm field or pasture can absorb from the atmosphere is highly variable and difficult to determine. Proper land management can help with climate change but in no way does it reduce the need to make major reductions in fossil fuel use, said Guðmundur Halldórsson, a research co-ordinator at the Soil Conservation Service of Iceland, co-host of the conference. And using farmland or pastures as a ‘carbon sponges’ will lead to all sorts of problems, Halldórsson told IPS. “The real key is adopt practices that enhance soil health to improve food productivity,” he said. That approach is much more likely to help in improve local livelihoods, protect water resources, improve biodiversity, reduce erosion and help put carbon back into the ground where it belongs, he said. Situated in the North Atlantic, the windy island was once mostly covered by forests, lush meadows and wetlands when the first settlers arrived nearly 1,000 years ago. By the late 1800s, 96 percent of the forest was gone and half the grasslands destroyed by overgrazing. Iceland became one the world’s poorest countries, its people starved and its landscape remains Europe’s largest desert. Of necessity, Iceland pioneered techniques to halt land degradation and in restoration. And for more than 100 years the Soil Conservation Service has struggled but the gains are small and very slow in coming. Today at least half of the former forests and grasslands are mostly bare and subject to severe erosion by the strong winds. “We’re still fighting overgrazing here,” Halldórsson said. Iceland relies far less on agriculture now and the harsh lessons of poor land management of the past are irrelevant to the 90 percent of Icelanders who now live in urban areas. “The public isn’t supporting land restoration. We’ve forgotten that land is the foundation of life,” Halldórsson said.